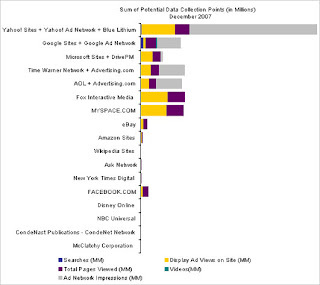 comScore also looked at ads served on pages anywhere on the Web by advertising networks owned by the media companies. These include text ads provided by Google’s AdSense network, for example, and display ads from AOL’s Advertising.com unit. In these cases, as well, there is the opportunity to collect a data point about a user and store it in a database. Why is this seemingly anonymous data so important? Much of this data may not be tied to a user by name but could be tied to one PC via the IP address of the PC itself or a cookie. In this way, the profile of a user can be assembled in a general way and more targeted ads can be served to the user of that PC. Yahoo, by far, came out with the most data collection points in a month on its own sites — about 110 billion collections, or 811 for the average user. In addition, Yahoo has about 1,700 other opportunities to collect data about the average person on partner sites like eBay, where Yahoo sells the ads. It is clear that Yahoo has built into their own sites and their partner sites a tremendous number of customer interactions that can be captured to a user-tracking database. As always, you have to wonder why Yahoo can't seem to do a better job at taking all this information and monetizing it. The point of all this, though, is that Yahoo has a potential goldmine of data. And that may be reason enough to acquire the company. In a quote from the New York Times article: “So many of the deals are really about data,” said David Verklin, chief executive of Carat Americas, an ad agency in the Aegis Group that decides where to place ads for clients. “Everyone feels that if we can get more data, we could put ads in front of people who are interested in them,” he said. Despite access to all this data, many of these sites don't put it all together in a way that improves their picture of individual users. This is an opportunity for the company with the resources and the drive to take data-driven advertising to the next logical level. The company that can offer better targeting can charge more for ad placement. This is the path to higher click-through rates and superior monetization. If Microsoft can reel in Yahoo, they may get the opportunity to realize the benefits of all that data rolling in.